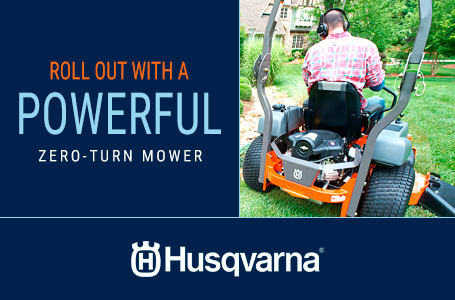 Husqvarna's yard tractors offer premium performance with quality results. Their compact size makes them easy to maneuver and require less space for storage. Features such as fender-mounted cutting height adjustment, adjustable seat and an ergonomic steering wheel make these tractors simple and comfortable to operate. All tractors feature hydrostatic transmissions for smooth, variable forward and reverse speed. Air Induction mowing technology improves airflow within the deck, ensuring a clean, consistent cut every time. For added versatility, all models can be equipped with a range of towable accessories and mulch kit for effective lawn fertilization. Pedal-operated hydrostatic transmission: Speed and direction are managed by pedals, which lets you keep both hands on the steering wheel, for optimum driving control. Adjustable sliding seat: Unique seat platform automatically changes height as seat is moved forward or rearward to optimize operator position. Air Induction: Our innovative Air Induction mowing system draws clean air from the top and bottom of the deck, enhancing air flow which results in greater grass lift and superior cut. Seat back height: Medium 13"
Husqvarna Automower® convenience and satisfaction guaranteed. Are you ready to enjoy your weekends again? 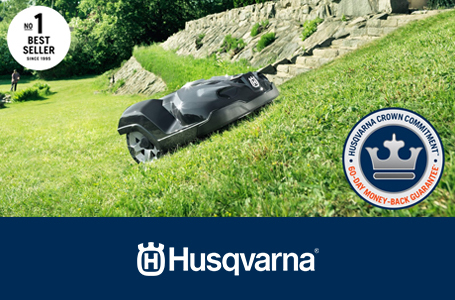 Say hello to Husqvarna Automower®, the world’s best-selling robotic lawn mower. We’re so confident that you’ll fall in love with Automower®, we’ll give you a couple of months to try it at your home or business. If you’re not satisfied with the performance of your Automower® within 60 days of buying it from a Husqvarna dealer, return it to that dealer for a full refund or exchange. It’s that simple! So, why wait another minute? Experience the evolution of lawn care with Husqvarna Automower®. If you aren’t 100% satisfied with your purchase of a Husqvarna Automower®, simply return the unit to the selling dealer within 60 days of purchase for a full refund or exchange. Qualifying products must be returned within sixty (60) days of the original purchase date. Units returned after 60 days are not eligible for refund or exchange under the program. The program applies only to Automower® units. Related items such as accessories, repair parts, etc. are not eligible. Products damaged due to improper use, abuse, neglect or failure to operate and maintain the unit in accordance with the Operators Manual do not qualify for refund or exchange under the program. Products that have been stolen, damaged due to abuse or neglect, or damaged by fire, water, wind or other acts of nature do not qualify for refund or exchange under the program. Products purchased on the Internet do not qualify for the program. 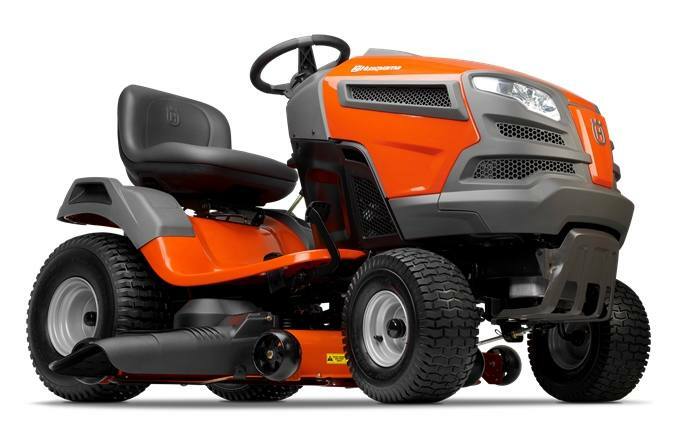 If a qualifying product is returned during the 60-day program period, but it has defective damages exceeding 75% of the repair cost, the product is not eligible for the Husqvarna Crown Commitment™ program. Customers are responsible for following all instructions in the Operators Manual, as well as the guidelines in the Husqvarna Warranty Statement. Failure to follow these instructions may void the offer. Re-sold products do not qualify for the program. *Special Husqvarna Financing options are available for qualified applicants. Financing is only available on new equipment purchases. This is a limited time offer at participating dealers only. Some restrictions apply. Estimated using 48 month EP0% APR (2.09%) with 450x Automower and a small install kit. Financing available with approved credit on purchases of $3,000.00 or more. 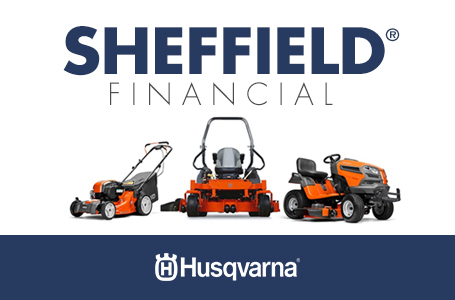 For details, ask your local Husqvarna dealer. Offer valid only a participating independent Husqvarna dealers. Now you can save time – and money – on a picture-perfect lawn. Tired of spending your Saturday pushing a lawn mower around the yard? 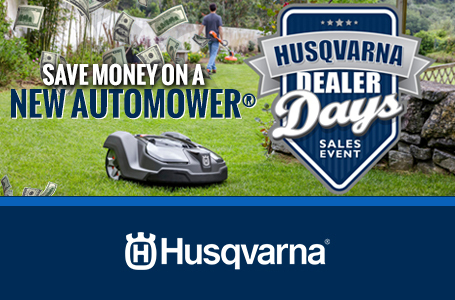 Stop by your local Husqvarna dealer during the Husqvarna Dealer Days sales event for savings on the Automower® robotic lawn mower. For a limited time, when you purchase select Automower® models, you’ll receive an instant rebate of up to $300. Mowing your lawn is now as easy as using your smartphone or saying the word to your Amazon Alexa device. Visit the Husqvarna Dealer Days sales event at your local dealer today!